In Disaster Capitalism: Making a Killing out of Catastrophe, acclaimed Australian journalist Anthony Loewenstein turns his passion for justice to deliver a stunning critique of the thriving disaster capitalism industry, in its many forms; the profiteers of privatized detention, militarized security, the aid industry and multinational mining are relentlessly skewered with style and poise, and their predatory tactics exposed. According to his narrative, Hillary Clinton is exactly the kind of neoliberal hawk that enables neofascist demagogues like Trump to rise, and allows predatory 'businessmen' like Trump to prosper. 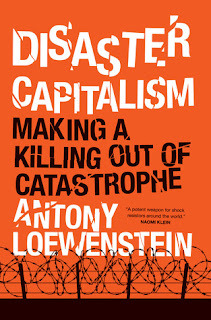 Both Presidential candidates are indeed invested in disaster capitalism, but Loewenstein's tale is arguably one that focuses on the Hillary's of the world; the trusted and experienced hand; the status quo; the Establishment. 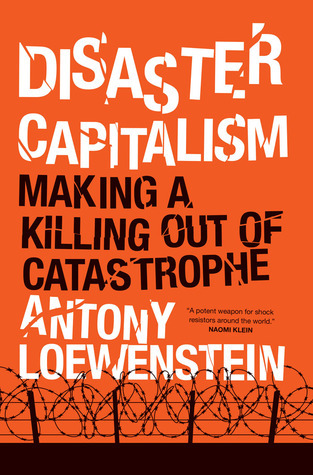 Disaster Capitalism is the story of Loewenstein's journey into the belly of this particular beast. The book gives us an up-close-and-personal look at how corporations like Serco, G4S, Halliburton and their ilk profit from organized misery, perpetual conflict and the impacts of disaster, and how national governments and international organizations like the IMF and the World Bank are willing collaborators. In Part I, he takes us to Afghanistan, Pakistan, Papua New Guinea and Greece, exposing the various exploitative strategies employed to enrich the local elite and foreign interests, and the devastating effects on the majority of people in each country. In Part II, we visit wealthy Western democracies (Australia, the United States and the United Kingdom) that punish the most vulnerable in their societies while dictating economic conditions to the world, imposing taxpayer funded cruelty for private profit at home and abroad. This is an absolutely enthralling read; a must for the revolutionary; the dreamer; the activist; the teacher; the learner. Loewenstein has compiled a treasure-trove of evidence on his travels. His dismantling of the social and economic myths that enable predatory disaster capitalism is robust and compels us to action. He offers a "challenge to cherished beliefs concerning aid and development, war and democracy, and in particular the modern, borderless nature of capitalism." (p. 14) For this reader, 3 key themes emerge; a dialogue around crime and punishment; a critique of the idea of benevolent corporations; and the grim reality that this is all part of a plan, a rigged system that empowers and enables predator capitalists to flourish. As the prison-industrial complex has rapidly taken hold in Western societies, the public clearly favours an ideology of punishment over reform. In addition to highlighting issues around race and class, Loewenstein speaks to issues around the treatment of those in the care of the state, and how "lobbying, ideology and a punishment ethos have colluded to produce one of the most destructive experiments in recent times: mass incarceration." Over the past 2 months, we have witnessed a brutal crackdown on drug sellers and users in the Philippines, since the rise to power of President Duerte. Summary executions on the streets have shocked the world, yet few official condemnations are forthcoming. While it is not difficult to imagine that many politicians and indeed members of the public might secretly support these abuses of power and share the President's disdain for Article 10 of the Declaration of Human Rights, as Loewenstein finds in Australia, America and the UK, there is an infinitely more 'subtle' way to enforce the harshest punishments: through private contractors. In Australia, the UK, the US and Greece, Loewenstein exposes the fact that asylum seekers and migrants are also punished, most often without breaking any law. In Greece, he provides a rich cultural background of "not just economic harshness, but a culture that tolerated and celebrated exclusion." (p. 69) In the grips of imposed austerity measures, the social fabric began to unravel and "Popular frustration was taken out on the most marginalized group in society: refugees." (p. 72) The mandate for demonization of the vulnerable that was secured in Greece, as in Australia, was just one tactic used to ensure profit for human rights abuses across the countries that Loewenstein investigates. Time and again, Loewenstein finds governments all too eager to enable those corporations in a position to cash in. He details how the EU has become central in "funding, encouraging and pressuring EU nations to isolate and imprison asylum seekers." He discusses the industries that have sprung up and thrived, often with the EU leading "the charge in working with corporations that have been very willing to develop and hone methods for repelling the desperate hordes." As 'Fortress Europe' closes her borders, deals like that done between the EU with Turkey are sealed without a second thought for the human cost. Corporations and corrupt governments profit; the vulnerable are turned away and suffer. In Bougainville, PNG, Loewenstein meets members of the resistance against resource exploitation, and explores the shady relationships between corporate and political interests. The memories of violence fuelled by greed and repression do not fade easily. The health of the community and the environment have also been terribly compromised. "Environmental vandalism should not be the price tag for 'progress'," he pleads. The overwhelming message is that simply outsourcing your cruelty is a convenient way to avoid responsibility, transparency and accountability, while profiting corporations and manipulating the economy. Neoliberal governments would like us to accept the notion that corporations are ultimately benevolent entities that exist only to employ people, satisfy market demand and grow GDP. Loewenstein argues that "multinational corporations spent the twentieth century gradually reducing their obligations in the various jurisdictions in which they operated." (p. 243) What we have now is unregulated, unaccountable and secretive private sector entities. Meanwhile, governments with dirty work to outsource are not left disappointed. Unfortunately, a willful ignorance of the sometimes devastating social impact of 'business' has allowed a mentality of self-righteousness to fester, completely detached from the suffering of people that stand in the way of profit, those targeted by governments for suppression and oppression, and the unfortunate citizens of countries outside of the US circle of trust, whose lives appear to hold so much less value than those of allies. Companies like DynCorp and Blackwater, despite having their abuses repeatedly exposed, thrive in this context. Loewenstein exposes, time and again, the fact that the global economy is dominated by anti-democratic and predatory forces that profit the wealthy and the ruthless. The revolving door between corporations, lobby groups and government is clear for all to see. This collusion between powerful actors fans the flames of crisis while selling market fundamentalism as the antidote and positioning 'benevolent' corporations to reap the benefits. In the U.S. the banks were bailed out while personal debt, and indeed poverty rates, soar. Loewenstein offers a stinging critique of a system rigged for the 1%, and the scandalous truth that in the US both major parties represent similar corporate interests while the media feigns ignorance. Indeed, liberal presidents have done little for the vulnerable other than make empty promises. Meanwhile, in Haiti, Loewenstein describes an environment of "canny capitalists sifting through the ashes of a disaster, looking for business opportunities." (p. 109) His narrative of this historically vulnerable nation describes the strong 20th Century American support for successive brutal dictatorships, enriching U.S. interests and a local elite. We see this model replicated again and again in Disaster Capitalism, and indeed around the world as a key element of U.S. foreign policy. The example, in chapter 3, of the "devoutly anti-Communist" 'Baby Doc' Duvalier is particularly damning, who, "unlike the many African despots targeted by the Hague, remained a friend of the West and was therefore largely untouchable." (p. 110) When the neoliberal agenda was challenged in Haiti by Aristade, the U.S. and local elite conspired to overthrow the government to restore 'order'. In a similar vein, most development aid to PNG from Australia since its independence either found its way into the pockets of either the wealthy PNG elite or Australian corporations. Far from its claimed humanitarian ideals, Loewenstein says that the main goal of the Australian government in PNG was simply, "to ensure that Australian corporations had a ready market in which to turn a profit." (p. 172) The denial of complicity with oppressors in the violent struggles of the 1980s and the patronizing attitudes displayed by Australian diplomats leaves a bitter taste. Loewenstein reserves some of his harshest criticism for the mainstream media, and the "false construct of "balance" that permeates the corporate press, which merely pits one powerful interest group against another" and one that "views business and political leaders as far more important than the individuals and societies affected by them." (p. 10) As an independent journalists that opposes the state of his profession, he laments the fact that "90% of Americans rely on information from media outlets owned by only six multinationals, including News Corporation, Comcast and Viacom." Loewenstein shows us how accepting something terrible (e.g. abuse of asylum seekers, mass incarceration etc.) out of a fear of personal harm, insecurity or loss gives a perceived legitimacy to profiteers (perhaps the American elections will be a case in point of this mechanism, on both sides). He wrote the book to "shock, provoke and reveal." (p. 16) The question is; once we know all about the profiteers of calamity, will we just carry on or will we fight for justice?